Nature in its pristine form has always been mystery for me rather than a soothing sight. It compels me to explore the intricacies which renders it so pure and complete in its absoluteness. My special love for the ‘untouched’ nature made me read numerous blogs and research a 1000 articles and finally I set my sights on exploring ICELAND. The land discovered by vikings is famous for its raw beauty and notorious weather but is a heaven on Earth. Maybe it isn’t even a part of earth - it just feels like a different planet. 100’s of kilometres of barren land only to open up to moss covered fields which then give way to black sand, it seems the road to discovery has no end ! 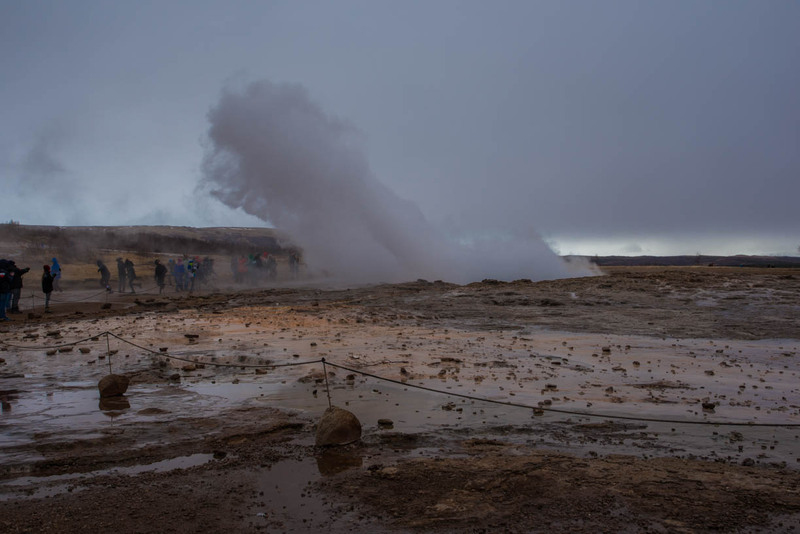 I decided to take a road trip through Iceland, which I knew from the first day was the best and an economic way to explore and discover the pricey tourist destination. I shall divide the blog into 4 parts for ease of reading and registering in memory (based on the route I took). So here goes the first part. Food : Suit yourself ! I survived on Skyr, dry fruits and instant noodles. Purchasing from Bonur/Kronan is really helpful. Car rental: I picked up my rental, a 4WD Toyota RAV4 from Cars Iceland (their office is just 3 mins walking from the airport and there is also a shuttle bus service every half hour to drop you off at the offices of the various car rental companies around the Keflavik International Airport). I had pre-booked on the internet for the duration of my trip and I found a good deal on it with free GPS ... yippeee ! It's always an intelligent decision to prebook cars in Iceland because the rental prices for on-spot booking are sky high ... umm no wait ... galaxy high ! I reached Reykjavik on a day when it was a celebration time and to my utter dismay even the supermarkets (Except 10-11) were closed. 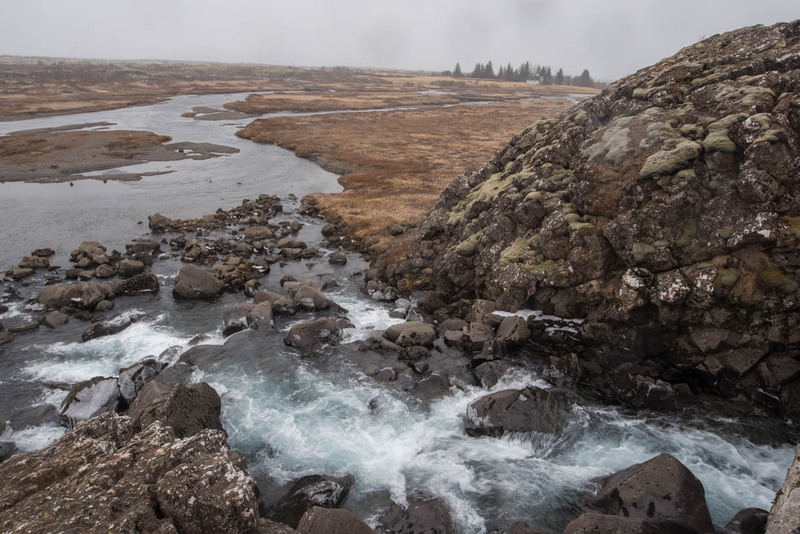 I picked up my rental car from www.bluecarrental.is located at a stone’s throw away from the Keflavik airport. I opted for a 4WD with Automatic transmission and was given a Toyota RAV4 in impeccably good condition. After adapting to an entirely opposite rule of driving conditions I was headed towards Reykjavik for my first night stay at the Bus Hostel . It is situated a bit outside the main city but at a very convenient location. There is a 10-11 store nearby and I got my first night’s dinner from there (saviour in distress). The next morning I was greeted by snowfall and the receptionist informed me that the tours for the Golden circle were cancelled due to the bad weather conditions. What a bummer ! But since I had my car, I could go ahead and give it a try (the Icelandic way of doing things - Never give up!). So I headed out to Reykjavik and picked up some rental equipments from Iceland Camping Rentals. I highly recommend this store for all your rental needs. Delphine who runs the store is extremely helpful as she made sure I got my car power inverter even on a holiday ! A big thanks to her because without it I would have been in serious trouble. I headed out of town using the app maps.me which is an incredibly useful online and offline Android app for navigation in Iceland. This National Park is famous for housing the world’s first parliament and for the unique activity of scuba diving between the two tectonic plates of North America and Europe! The dive occurs at Silfra (mainly organised by www.dive.is )and is a unique experience (didn’t do it personally but got reviews from the travellers who dived in). I tried my level best to get some photographs but it was terribly windy and the rainfall prevented me from getting any decent shot. Also, since it was my first day in Iceland from a tropical climate of 40degC to 3degC, I was having a hard time adjusting to the brutal weather conditions. The winds were ridiculously blowing at nearly 80 -100 kmph ! After strolling around for sometime I decided to move on to my next destination. The famous natural phenomenon of hot water shooting up in the sky seen in the videos of Iceland was my next stop for the day. It was very crowded even on a cloudy and windy day. Photographing in the wind was again a challenge here because the water shoots up pretty high and the sudden gust of winds were spraying the water as a fine mist on the people who were standing close. Fortunately I could judge this mishap before it occurred and took the precautionary measure of positioning myself away from the ‘hot spot’ of photographers. Its important to exercise extreme caution there as the water is scalding and has a temperature of 90 -100 degC and the nearest hospital is located 62 kms away. There are rope demarcations preventing tourists from entering the risk zones, and IMO its best not to cross them and be adventurous in a stupid way. 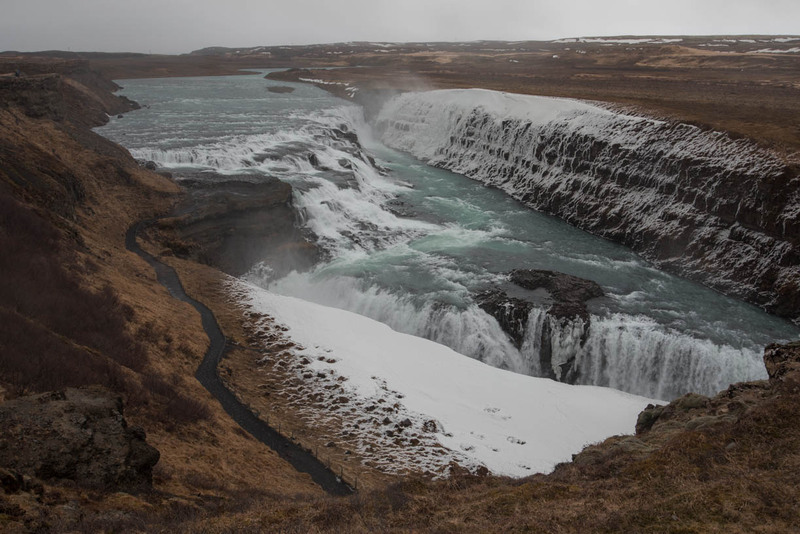 The mighty Gullfoss - thats the phrase which everyone utters when they see this spectacle for the first time ! A waterfall of gigantic proportions which had a lot of ice around it is an absolute bliss to photograph on a sunny day and an absolutely horrific experience to photograph on an overcast and extremely windy day. The ice was blown away by the wind and was hitting the face so brutally that one flake could badly injure an eye if it hit it directly. I had to wear my shades even on that cloudy day to prevent any damage to the eye. I could get a good shot and a beautiful slow-mo video of the waterfall. Later on I headed on the Kerid crater but could only hike down without my camera to get a view of it as the rain had begun to come down really hard by that time. Place to stay : I decided NOT to spend the night in the car as it could be risky and headed to Selfoss to stay for the night at Selfoss HI hostel and was given a single room at a nice discount by the friendly German who was in charge. The next day I started from Selfoss having stocked on my food supplies for the next 14 days from a store called Kronan (there is also a BONUS store nearby but it opens a bit late in the mornings). The iconic waterfall made famous by SRK in the song Gerua. Many thought that the rainbow was a special effect, but the rainbow in fact is a very common phenomena on a sunny day. As is my luck of travelling in a shoulder season, there was no interesting colour but just the might waterfall. What a fall !!! I was staring at it for the first 5 minutes just trying to gauge its intensity and fervour. The unique feature of this waterfall are the stairs which lead to ‘behind’ the waterfall where there is a cave like formation for clicking the much coveted pictures from behind a waterfall. I used my mobile to get those picture because there was no point in taking a camera is the lens was getting covered by mist in a split second. But the feeling of standing there behind a waterfall was second to none. The feeling of kicking one off the bucket list is so satisfactory ! This is a hidden waterfall very close to the Seljalandsfoss. Going in takes a bit of perseverance as one has to balance oneself on loose rocks. Its best to access in barefoot to prevent the shoes from getting wet. The waterfall is right above you once you manage to reach in and find a spot to stand. A waterproof cover for the camera/smartphone or an action camera is highly recommended for taking photos at this place. Okay , lets get this straight - this waterfall is HUUUUUGE. And I mean every alphabet of it ! The gigantic proportion of this natural wonder makes you awestruck and you need to pinch yourself to understand that this is really happening. Voluminous to an extent that a normal video looks like a slow-mo when viewed on screen, this is one of the best waterfalls I have seen till date. Birds flying in front of the falls and people looking like ants in proportion to the fall makes this a place to get a perfect picture showcasing the enormousness of nature in comparison to mortals. There is a solid staircase path for accessing to the top of the falls. The water is so calm up there as it flows horizontally only to have a completely vertical drop of nearly 50 metres. P.S : For drone lovers, this place is a paradise. But beware, I met a fellow photographer who crashed her drone after losing control to the extreme winds.Don’t crash your drone as it’s gonna pollute nature at some point of time. The water was bone chilling cold and was a great quencher to my parched throat. Who hasn’t seen the iconic photograph of the wreckage of a plane in Iceland ? This is the iconic spot where a US Army plane crashed during WW-II when the pilot changed over to an empty fuel tank by mistake only to crash his plane in the middle of black sand. There were no casualties from the crash, but I wonder how much time did it take for a rescue team to arrive back in those days ! 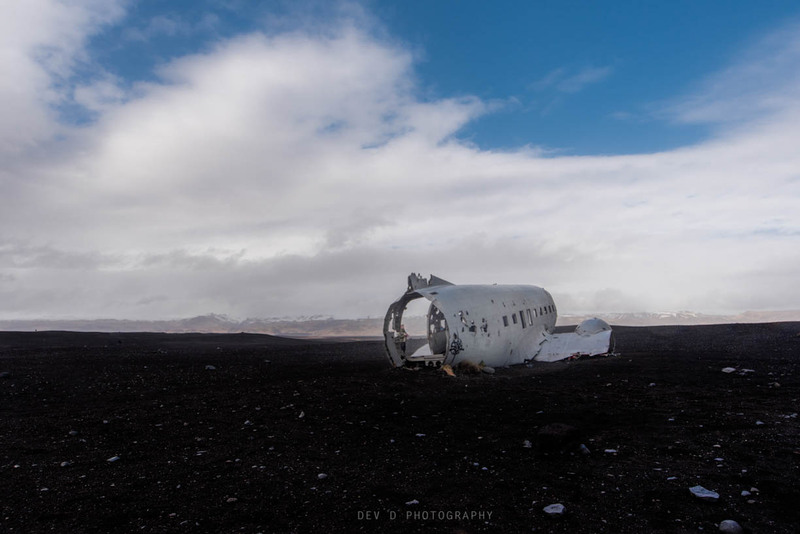 The wreckage has become a hot tourist spot and a picture in front of the plane is a testimony of the fact of having visited Iceland. Its disheartening to know that tourists have salvaged and even taken away parts of the plane as souvenirs for their personal collection. I saw a team from USA shooting the ending scene of a music video there. A very classy choice I must say! There was a group of tourists with their guides on ATV’s dressed in orange jumpsuits and against the backdrop of grey skies and black sand it looked as if they were astronauts on the moon. What surrealism ! 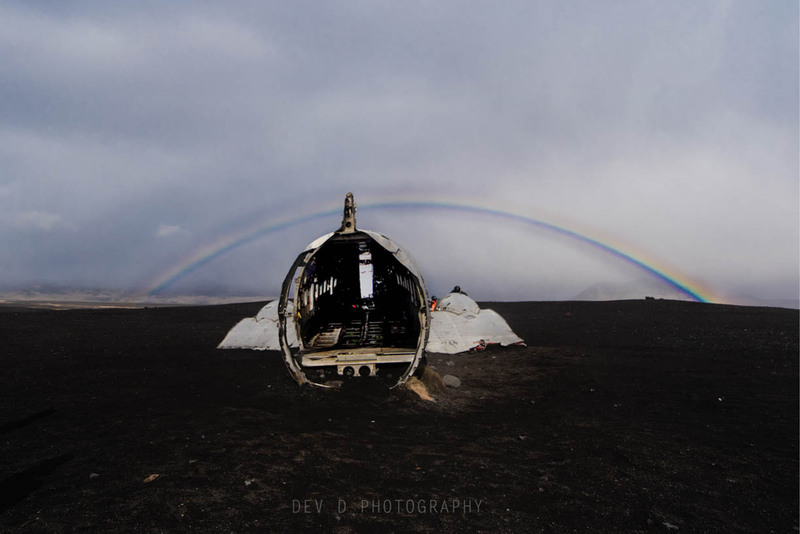 I was lucky to photograph the plane with a rainbow in the background (perks of being a crazy fellow who braved the windy conditions). CAUTION: The road to the site has been closed off from the main highway by fence and its NOT possible to take the car to the crash site. A 4 km walk (approximately 40 minutes) needs to be undertaken to reach the site but its totally worth it ! Barren land on both sides and walking on a path highlighted by markers makes for one of the most vivid memories of a lifetime. 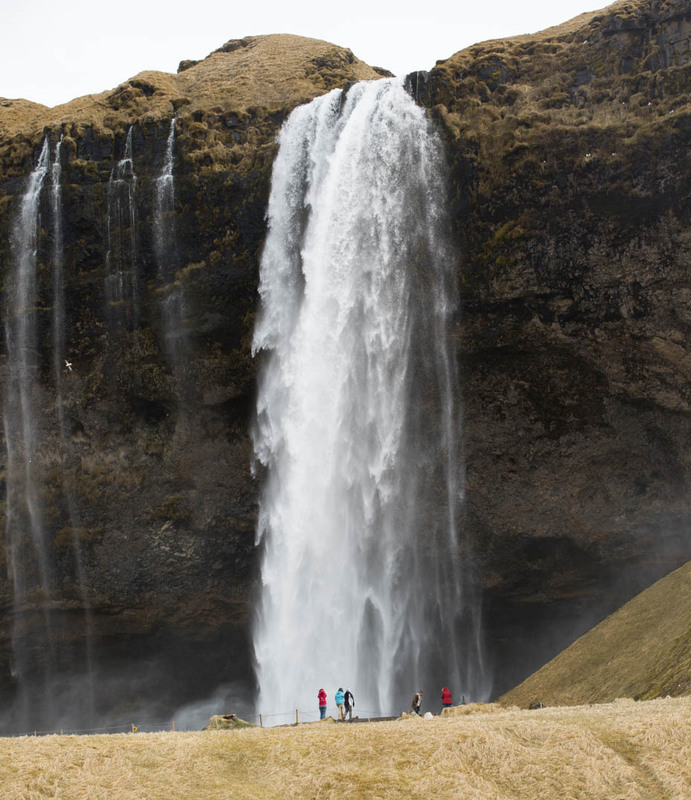 Place to stay: I slept at the campsite adjacent to Seljalandsfoss waterfalls. The incredibly friendly care taker shared a tonne of facts about the Icelanders and the legend of the Vikings. Turns out that 'The Mountain' of GOT fame is his batchmate ! And there was a very friendly and chubby cat who very comfortably slept on my chest for the night.